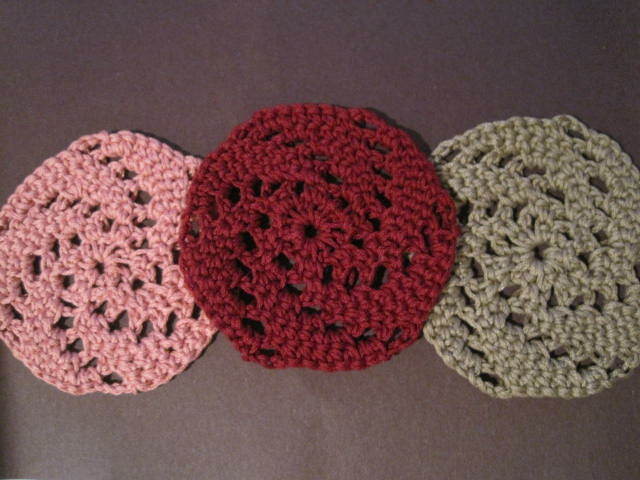 Coasters are a great gift, an awesome way to add some color to a room or end table, an effective stash buster and a great way to introduce crochet to a beginner. This week’s coasters look best in a solid color (in my opinion) and only take a very short time to make up. See Cool Coasters 1 and look out for a couple weeks more of free coaster patterns to come! Do not join from here throughout pattern, unless otherwise noted. Place stitch markers at the beginning and end of round if need be. To learn more about stitch markers and there uses see Always Crochet With Stitch Markers. Finish off, make it pretty! This entry was posted on Thursday, October 28th, 2010 at 12:00 PM by Erin Burger	and is filed under Free Crochet Patterns. You can follow any responses to this entry through the RSS 2.0 feed. You can leave a response, or trackback from your own site. Wow i really like these coaster’s too Rachael…Can you use cotton yarn for these…Or do you have to use the sport yarn? ?.What is sport yarn? I get confused with yarn..
Jackie, sport refers to the weight of the yarn (how thick or thin it is). Most yarns will tell you their weight on the packaging. You can use cotton yarn as long as it is the weight required. I made “cool coasters 1” with size 4 cotton yarn with good results, and will probably try this pattern with size 4 since it’s what I have on hand. I have never seen mercerized cotton yarn for sale locally, and I don’t recall seeing a size 3 cotton yarn. Is there a reason that the specific yarn used for each project isn’t mentioned here on Crochet Spot? I am always curious about what specific brand and product was used. The mercerized yarn I use for the coasters is from my grandmother’s yarn stash. She used to use it for change purses and potholders. It’s very thick and sturdy. I’ve never mentioned the particular brand just so it can be universal, like any brand can be used as long as it’s the right weight and the gauge turns out correctly. Were do I buy sport wt. cotton? I have never seen it. Im a beginner, i have been trying to make these coasters. How do i create spaces? “Round 1: ch 5, sl st in first chain made to form ring, ch 1, (sc in ring, ch 2) 6 times; join with sl st in beginning ch-1: 6 sc, 6 ch-2 spaces”. I am unable to understand the pattern. Hi Su, the numbers after the colon are telling you how many stitches where creating in that row. In this case there were 6 single crochet stitches and 6 ch-2 spaces. A “ch-2 space” is the space that was created when you made the ch 2. So there are 6 of those spaces in round 1. These look great! When you used mercerized cotton, did you use #3 crochet thread or some other cotton yarn, such as Sugar n Cream ? I’d like to use #3 thread because I think that the coaster might be flatter and lay closer to the table and to the glass/stemware/mug. Great design and have used this as a centre of a doily then proceeded with the pattern. P.S. : My coaster seems to look more like a woollen cap : hahahahahha !!! Thanks for catching that! I will update the pattern now. Can you tell us how you finished off? At the very end of the last round, I would recommend slip stitching into the ch-3 that’s at the beginning of the round, so you join the end of the round to the beginning. Then you can cut your yarn and weave in the end.